But not until August! Bummer! However, the project I have to show you today gets me in the mood for our upcoming vacation. This is another project that I created for my upline's website as one of her Featured Artists for this Catalog. She has given me permission to post the pictures here as well. I think the technique of stamping on candles is so cool and when I was working with this stamp set called 'Seaside' (which is going dormant with this catalog, btw) I thought how fun it would be to mimic the candles I often see in high end gift shops (read - expensive!) and place the shell images around the base and cover them with sand. So, I stamped my images with Blue Bayou, Creamy Caramel and Close to Cocoa onto tissue paper, cut them out and wrapped them around the candle with wax paper. Holding them in place, I used my Heat Tool to melt the stamped tissue into the surface of the candle. Once all the images were in place, I painted the base of the candle with Crystal Effects and rolled it in craft sand. The picture is a little dark to see it well, but in real life it is very cool. The wrap at the top is layered cardstock in Blue Bayou (retiring soon!) and Naturals Ivory. I crimped the Blue Bayou and stamped shells onto the Naturals Ivory along with the speckled background from Itty Bitty Backgrounds. I then slightly wet the Ivory cardstock and crumpled it multiple times, spreading it out to dry. Once it was dry, I sponged it lightly with Creamy Caramel ink. The wrap was finished off with a stamped starfish image, Creamy Caramel on Naturals Ivory, which was cut out and tied around the other layers with Blue Bayou stitched ribbon (also retiring!) I used a Pewter Jumbo Eyelet and my Crop-a-Dile to create the resting place for the ribbon knot. The ribbon ends are distressed to match the overall look of the candle. If you want to learn how to stamp on candles, leave me a comment in this post. If there is enough response, I can work it into Stamp Camp in July before all the In Colors are gone! See you tomorrow with my weekly Blogger's Challenge post! Don't forget to enter the card giveaway contest in one of my earlier posts this week - it ends tomorrow! i would love to learn this technique. 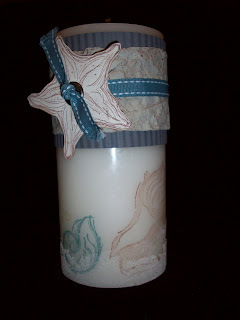 I love making stamped candles but would never have thought of adding sand to a candle. Such a great idea...I will have to try it out!